Real vanilla beans are a fantasic ingredient (particularly for baking) that should not be overlooked. They bring tremendous flavor to all sorts of desserts, from custards and mousses to ice cream & cakes. Some chefs even use them in savory applications like sauces for lobster and veal. 1. Place the bean down on a cutting board. Draw the point of a paring knife’s blade down its length until the pod is split into two pieces. 2. Take each vanilla bean half, turn it so the shiny inside is facing up, and scrape out the tiny vanilla seeds. Add the seeds to your recipe. Don’t throw the vanilla pod away. It still contains a great deal of flavor. Note: You don’t have to use a whole vanilla bean in every recipe. To use part of a bean, simply use kitchen shears to snip the bean into halves or quarters, then split & scrape these pieces using the method above. Store any left over pieces with your other beans, but be sure to use them soon, as they will likely dry out faster. Though the pods have some flavor (see uses below), the primary flavor in a vanilla bean comes from those tiny seeds. They offer a more subtle, complex flavor than extract, and are great for custards, ice creams, mousses, panna cotta, tart fillings, flavoring simple syrups (for cakes, cocktails & drinks or sorbets), and a million other applications. In addition to their flavor benefits, they add visual appeal to light-colored dishes where vanilla extract would tint your dessert. People who love vanilla are always excited to see those telltale little specks in desserts. Desserts made with real vanilla beans will develop more complex flavor over time, so vanilla ice cream bases are best “aged” in the fridge for a few hours (ideally overnight) and vanilla flavored custards will be even better the next day. For custards, hot chocolates, and other recipes where liquid is warmed: you can add the pod halves to the liquid along with the seeds during the heating process, just remember to extract the pods later. Flavor from the pod will be steeped into the liquid along with the remaining vanilla seeds clinging to the inside of the pods. Make homemade vanilla extract or vanilla vodka: While you’ll probably want to throw some fresh vanilla beans in as well, leftover pods can be added to alcohol to make vanilla extract at home (homemade vanilla extract recipe). If you pull the pods from the alcohol before the mixture has reached extract strength, you’ll be left with vanilla vodka which is perfect for mixed drinks. Make vanilla sugar: Making vanilla scented sugar at home is extremely easy, and another good way to make use of your leftover pods. Though often called simply “vanilla sugar” by home chefs, this sugar’s flavor & scent are much more mild than the vanilla sugar often used by professional chefs, which is mixed with lots of ground vanilla beans. If you want to make stronger vanilla flavored sugar by actually grinding up your beans, you’ll find instructions in our Flavored Sugar Recipes post. 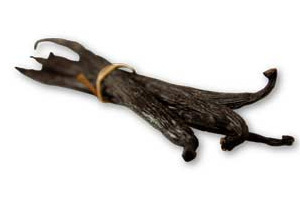 Remember, though vanilla beans can be expensive in grocery stores (and often dried up), fresh vanilla beans can be very affordable if purchased by the pound. Buying either bulk bourbon vanilla beans and bulk tahitian vanilla beans will allow you to freely enjoy & experiment with one of the world’s most coveted flavors without breaking the bank. Homemade vanilla extract & vanilla sugar make great gifts! Hard to believe, but I’ve never actually used fresh vanilla.